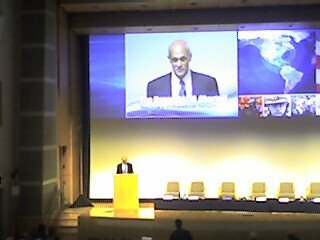 Secretary of Homeland Security Michael Chertoff provides the second keynote at today's DHS S&T Conference. 1. Protecting against dangerous people (with nearly 5 million people entering the U.S. each year, border agents have mere seconds to decide and act). Biometrics can link collected intelligence from overseas (e.g., at compromised terrorist safe houses) with incoming personnel at ports of entry, creating a deterrent for terrorists who seek to cross borders. 2. Keep dangerous things out of the U.S. Radiation portal monitors are being deployed to scan *all* inbound cargo for fissile material. Explosive detection devices that screen baggage are being enhanced through millimeter wave technology. 3. Smart acquisition that considers all elements of a system. "Technology only works in the context of the system in which it operates.... It is only in the whole system that these gizmos and gadgets can make a difference." 4. Integrating DHS as a unified entity. DHS is seeking to consolidate its seven national networks into a single system supported by a cybersecurity initiative. In closing, Secretary Chertoff said, "We will continue to build on the technology and ingueniuty of people like you to allow trade and travel to proceed safely and securely.... Our greatest strength as a nation is ingenuity and creativity enabled by freedom."